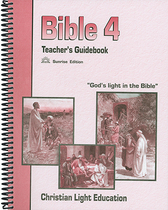 Bible 400 expands the study of the Gospels started in Bible 300. LightUnit 401 – Contains fictional stories that teach facts about Jewish holidays and wedding customs. Students will also learn about the customs and daily activities of Jews during the time of Christ. 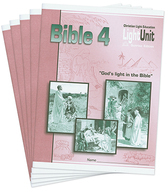 LightUnit 402 – Focuses on the parables of Christ. The parables are explained simply and their lessons are applied to the students’ lives. LightUnit 403 – Contains lessons teaching about stories Jesus told and miracles He performed during the last months of His life on earth. LightUnit 404 – Lessons focus on events that happened during the last weeks of Jesus’ life—from Mary’s anointing to supper in the Upper Room. 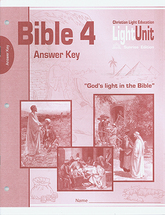 LightUnit 405 – Contains the final events of Jesus’ life on earth—in the garden of Gethsemane to His ascension. This answer key is not required if the Teacher's Guide is purchased.